Whenever we’re dealing with a concept, people usually have mixed feelings about it. It’s not the case with the 8 Series Concept apparently, as the world seems to unanimously agree that it looks just about perfect. Be that as it may, the production version will most likely be slightly different and it still remains to be seen just how much of the concept will progress into the next stage and onto cars we’ll be driving on public roads next year. And when it comes to unwinding the secrets behind how a concept was brought to life, nothing beats having your own private tour done in the presence of the designer behind it. That’s what BMW offered the audience present at the Goodwood Festival of Speed this year, where it brought along the 8 Series Concept and its creator, John Buckingham. The video below is nowhere near as long as it should be, but it does reveal some of the thoughts behind how this beauty came to be. For example, Buckingham explains from the get go that the 8 Series Concept is not meant to be a direct replacement or successor of the initial model, such a task being rather hard to achieve successfully. 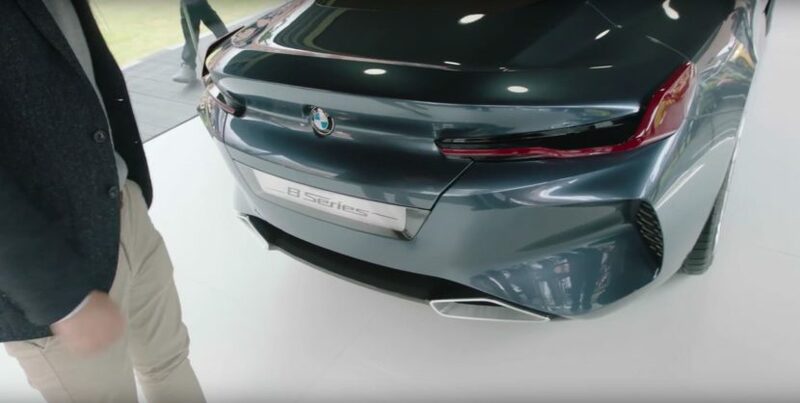 Furthermore, the whole idea behind the concept was based on the center line of the car, which is unique to the 8 Series since the 8er is a two-box, unlike most BMWs which have a three-box design. Another interesting detail Buckingham goes over is the way the body creases were lined up, to reflect the light and create an aggressive stance at the same time. It’s quite interesting how he is pointing out something that was hiding in plain sight and you didn’t notice until he actually explains it. I guess that’s why he’s the mind behind the 8 Series and we’re just the ones adoring his work. I won’t go into further details right now, instead letting you discover everything else on your own by watching the video. Enjoy!